ZymoGenetics was founded in 1981 by University of Washington professors Earl Davie and Benjamin Hall, and Nobel award winning University of British Columbia professor Michael Smith with an initial focus of developing a method of growing human insulin in yeast. The following is a photographic tour of the ZymoGenetics historic landmark Hydro House and Steam Plant. In 1905, City Light in Seattle built the first of its hydroelectric dams in Cedar Falls, the nation's first municipally owned hydroelectric project. The city was growing rapidly and to address the demand for power, approval was given in 1910 to increase the dam's generating capacity and construct a new hydroelectric plant within the city. While financing for the Steam Plant was secured, another solution was needed to address the city's immediate power needs. The solution they found was the Hydro House. The Hydro House (originally called the Power House) was introduced and built in less than 11 months on the shores of Lake Union at a cost of approximately $30,000. 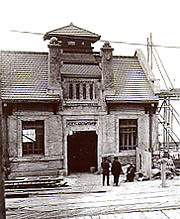 The original Hydro House, 1914. In 1908, the site for the Steam Plant was chosen. It was located on a wedge shaped property at the intersection of Fairview Avenue East and Eastlake Avenue East on the southeast shore of Lake Union, a historical industrial area in Seattle. 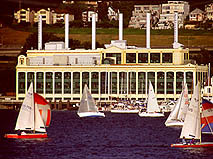 The Steam Plant is constructed on top of 2,000 wooden pilings driven into the shoreline of Lake Union. Steam Plant site on Lake Union, 1914.